The joke’s on him, however, because I plan to pack precisely one pair of flip flops and that’s it. OK, maybe two pairs of flip flops and my hiking sandals. That’s it. As for my running shoes and clothes, those will take up 1/8th of the space in my suitcase, tops. Hmmm. So maybe my running stuff does take up half a suitcase (it’s a very small suitcase!). I may not be the most efficient packer, but I’m a devoted vacation-exerciser. 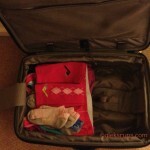 So here’s how I pack my vacation running paraphernalia essentials. Enticing as it sounds to brave this arctic South Bay November — no, seriously, it’s in the mid-60s here?? — and show up at the airport in flip flops, it only makes sense to travel in the shoes that take up most space. Had we been leaving on a ski vacation, then sure: I’d be wearing my snow boots. As it happens, my running shoes take up more space than my hiking sandals – and definitely more space than any number of flip flops that I end up taking. Also, wearing them ensures aroma containment, i.e. the rest of my clothes are not at risk of smelling like feet by the time we arrive at our destination. Bonus! Once you start traveling with kids, having to do laundry at least once (or 10 times) during a vacation becomes a given. But I never truly appreciated laundry until I started running (more than once) while on vacation. It’s one thing to let a change of stinky clothes air out, another to have to wear them several times. No thank you. 3. The little things add up! PowerGels (or GU) – should I be putting these in a Ziploc baggie? Could they get confiscated? I am sure I’m missing something, and that’s a disturbingly long list already. Suggestions? How do you pack for vacation? 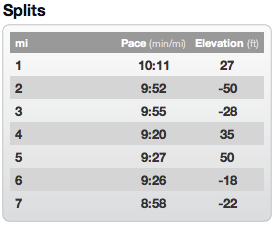 Woke up at 6 a.m. to sneak in an early-morning negative split 6-miler (3; 3). 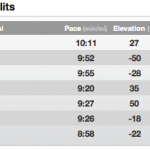 … but the running was more like hobbling. 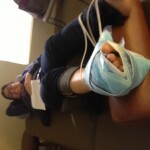 I felt pain in right foot almost from the get-go. It had started bothering me towards the last couple miles of Saturday’s half marathon and felt worse today. 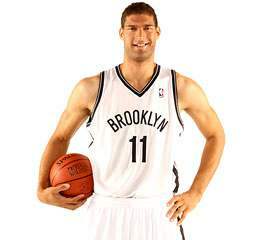 He says to me I could have a stress fracture and I spend the next five minutes in hell, waiting for x-ray results and listening to HusbandRuns go on and on about Brook Lopez. 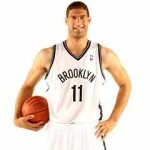 Brook Lopez — of the Brooklyn Nets — had a stress fracture in his foot too, and couldn’t play for an entire season. Let’s see. Why did this end up sideways? 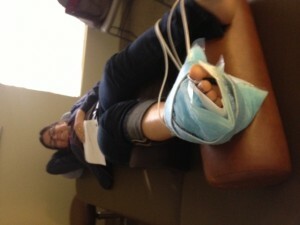 Then Doc says I don’t have a stress fracture, but I seem to be on my way of getting one – and I love him, regardless. The verdict is that I have to take it easy for the next two weeks, i.e. no running – but elliptical machines and biking is OK. Walking, too. I can do that! Boy, a 15-miler will be two and a half hours of pure elliptical fun torture. Oh well. Count your blessing, missy. It could have been so much worse!